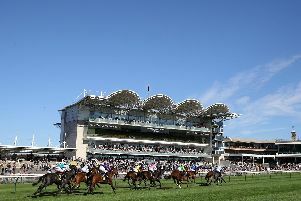 The Gazette's Wednesday racing guide: Three and easy for Saaheq? Saaheq is on a roll after making a late start to the campaign and can make it three wins in as many starts this term in the KFE Leaders In Frying Excellence Handicap at Nottingham. A 26,000 guineas recruit for Michael Appleby at the end of last term, connections have had to be patient with the four-year-old as he did not make his first start until last month. His team obviously had plenty of confidence in him on that initial Doncaster outing, though, as he was well supported and eventually went off joint-favourite on his first crack at five furlongs. Saaheq never looked like being headed, securing a ready one-length success, with his follow-up victory at Sandown coming in similarly easy fashion under a penalty. Technically 3lb well in on that latter occasion, the three-quarter-length margin does not reflect the ease of his win, with a further 5lb hike not looking enough to anchor his hopes this time, either. Burn Some Dust has seemingly found his niche now he has switched up in trip and should give another good account in the Georges Great British Kitchen Handicap. After striking gold on his first start at a mile and a half in July, he tackled the same one mile and six furlongs he faces here in August, triumphing by half a length. He could not bring up his hat-trick at Haydock last time, having to settle for fourth on soft ground which perhaps proved too much of a test for his stamina. However, good ground awaits at Nottingham and Burn Some Dust is one for the shortlist. Chynna makes a quick return to action in the Myddelton & Major Conditions Stakes at Salisbury after a decent effort in Ireland on Sunday. Mick Channon’s runner has proved a hardy type in running nine times so far this season, proving she is a just a little shy of top class with a couple of Group-race places along the way. She again found a couple too good when contesting a Group Three at Naas at the weekend, but it was still an admirable run and puts her well ahead of her rivals here, as long as she has recovered from her exertions. He has only had a handful of runs over the last two seasons and after a disappointing return from 550 days off the track at York in July, his effort on the Westwood in August offered a bit more hope. Hillary View can get back on the right track in Bangor’s Nicol Hughes Food Service Chase. He impressed when winning on his chasing bow at Worcester in August but could not follow up last month after a combination of a shorter trip, extra weight and some jumping errors cost him dearly. Hillary View still was not beaten that far, so another decent effort is anticipated. BANGOR: 2.20 Angel Of Harlem, 2.55 Lord Fendale, 3.25 Panko, 4.00 Hillary View, 4.30 Stepover, 5.05 Helium. CORK: 2.05 Aloha Wish, 2.35 Cruella Dovil, 3.10 Betsey Trotter, 3.40 Kodi’s Girl, 4.15 Cracking Name, 4.45 True Self, 5.20 Dream Point. NEWCASTLE: 5.30 Tommy Docc, 6.00 Gun Case, 6.30 Go Roo, 7.00 Improve, 7.30 Sir Domino, 8.00 Argon, 8.30 Pavlichenko. NOTTINGHAM: 1.30 Ustath, 2.00 Fast Strike, 2.30 Ya Hala, 3.05 Mr Diamond, 3.35 SAAHEQ (NAP), 4.10 Gravina, 4.40 Burn Some Dust, 5.15 Maygold. SALISBURY: 1.40 King Ademar, 2.10 Stormwave, 2.45 Nassam, 3.15 Jahbath, 3.50 Chynna, 4.20 Beyond Equal, 4.55 Hart Stopper, 5.25 Three Little Birds.